First of all, I would like to thank you all wholeheartedly for all the love, support and encouragement, you have given me so far, without which Padhuskitchen would not have reached this height. Many of you have been asking me to upload videos for a very long time, but I was unable to do so. Some of you even suggested and sent me links on how to take videos using smart phone. Thank you for all that. I had a mental block all these days that I cannot do all these alone. But now I have come out of my comfort zone. I am so excited to announce that I will be sharing cooking and few gardening videos on my YouTube channel. I have started this festival season with my favorite "sweet kolukattai recipe" video. This is a one women show where I cook, film and edit. It is lot of work. There may be flaws in my filming or editing as I am in the learning process, but I will try to give my best. I will be sharing videos every week. I am not going to stick to any particular video format though initially I will be shooting overhead videos . I have shared 4 cooking videos as of now. You can watch those videos by clicking the link below. 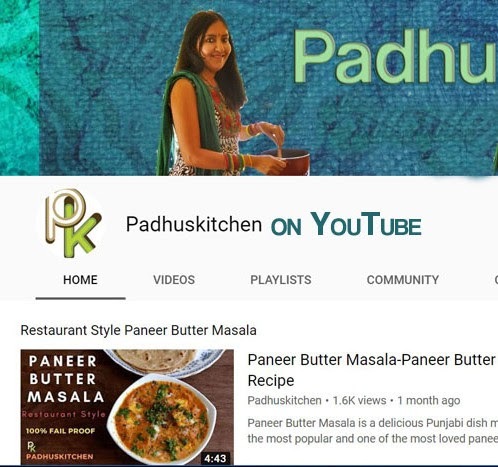 I would like you all to support and encourage me by subscribing to Padhuskitchen YouTube channel, so that I can carry this forward. I am sure you will not regret as I will try to give my best. Thank you wholeheartedly for your support. You support means a lot to me. I have subscribed to your YouTube Channel. Hope to receive some valuable videos on food preparation. All the best to you. Am a big fan of your cooking.... I have learnt so many varieties and ideas from your receipes. Taste turns out to be awesome always like magic. Am very thankful to you each time i see smile in ppl's face becoz of ur receipe. A big thumbs up for your youtube channel... Thank you once again. Thanks and hats off to your endless efforts for making cooking so easy with your wonderful recipes. All the best. I've subscribed. Look forward to the visuals of your great cooking! All the best Padhu aunty. Regularly i m visiting ur blog. Its very wonderful n useful too. can u post diet recepies or diet chart ? Very happy to see your mouthwatering dishes live in youtube continue rocking. I tried your Fried Rice Padhu. Amazing.To me even today your receipe stands first if I think of Fried rice. Great work.. please continue.